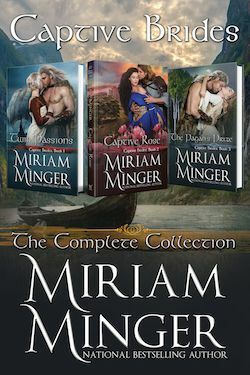 Enjoy three of Miriam Minger’s award-winning medieval romances in one extraordinary collection: Twin Passions, Captive Rose, and The Pagan’s Prize! Beautiful, feminine Anora finds her wedding plans suddenly shattered when she and her identical twin, tomboyish Gwendolyn, are kidnapped and taken aboard the Viking warrior Hakon Magnuson’s dragon ship. With the sheer strength of his muscular body, Crusader knight Guy de Warenne overpowered his captors and fled the hell-hole of the Syrian prison. Yet he couldn’t leave Damascus without rescuing the lovely violet-eyed “slave girl” Leila who had saved his life by tenderly caring for his battle wounds.